Supergoop! is a US-based niche brand dedicated to sunscreens, and the humorous brand name belies its goal: to "formulate products that you and your family actually want to put on: they are lightweight, never greasy or sticky and easily absorb into skin". That's great, since sunscreen can feel kinda icky to wear and apply (and also to reapply), although in recent years there have been quite a few non-greasy options from both Asian brands as well as Western ones (as a quick look through some of my previous sunscreen reviews will show. 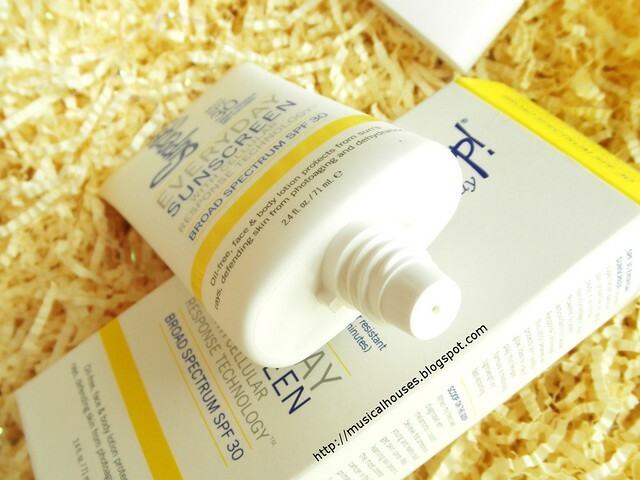 Still, it's always good to have another sunscreen brand to choose from - as I've mentioned in my blog before, I'm a pretty big fann of sunscreen, and I think it's one of the skincare products everyone should use. Anyway, marketing aside, I have the Supergoop! 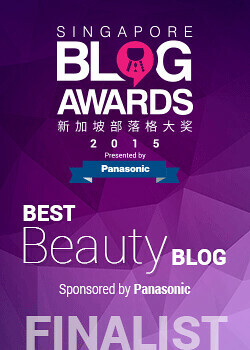 Everyday Sunscreen With Cellular Response Technology Broad Spectrum SPF 30 for review. 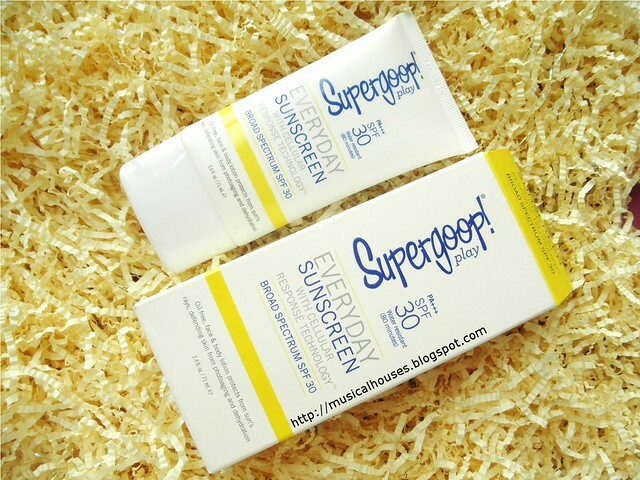 I got mine from Luxola, which seems to have sold out of this particular sunscreen but still have many others, but you can also get it from the Supergoop! website or Nordstrom. We're going to check out whether the Supergoop! Everyday Sunscreen lives up to its claims - whether it really does feel lightweight and non-greasy, whether it does provide adequate sun protection, and while we're at it, we'll also take a look at what the deal is with this Cellular Response Technology. And to do that, we'll start at the ingredients list! Supergoop! has listed the active ingredients separately, and also has provided percentages for each of the sunscreen filters used, which is great, so you really know exactly how much sun protection you're getting. Unfortunately, the UV filters used and the amounts they are used in (Avobenzone (3.0%), Homosalate (8.0%), Octisalate (4.0%), Octocrylene (2.0%)) seem to be used in quite low amounts: when checked against the BASF Sunscreen Simulator (which I highly recommend as a resource for cross-checking sunscreens), the calculator predicts an SPF value of only SPF12, and PA value of PA++ based on the filters used in the Supergoop! product. 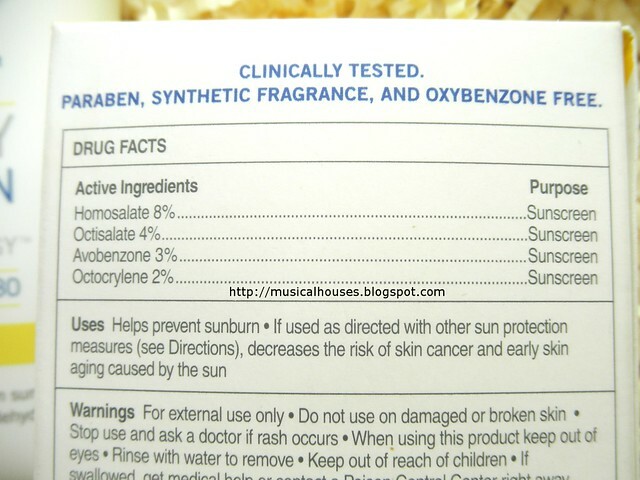 There are a number of reasons for why the Sunscreen Simulator's value is different from the actual product value, such as antioxidants and anti-inflammatories being included in the product, but ideally, the two should be as close as possible, since this is indicative of the sun protection in the product actually coming from the UV filters, rather than other ingredients like anti-inflammatories. So how do the UV filters in the Supergoop! 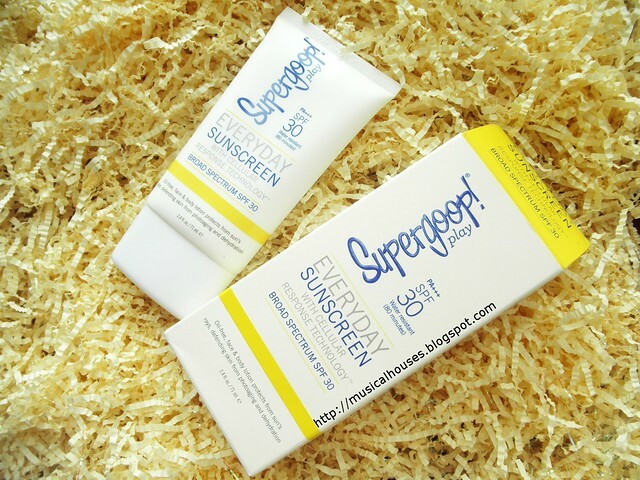 Everyday Sunscreen SPF30 fare? Well, Avobenzone offers UVA1 protection, Octocrylene offers UVA2 and UVB protection, while Homosalate and Octisalate offers UVB protection, so in totality, the UV filters in the Supergoop! sunscreen do offer broad spectrum protection. In terms of Avobenzone is quite unstable, and degrades over time, but can be stabilized with the addition of Octocrylene, which is present in the sunscreen. Meanwhile, Homosalate and Octisalate however, do degrade to some extent. So, on the whole, I guess the Supergoop! sunscreen looks somewhat stable, with the Avobenzone being stabilized with the Octocrylene, although it's probably a good idea to reapply since the Homosalate and Octisalate do degrade over time. Now that we've taken a look at the UV filters, let's check out the rest of the ingredients in the Supergoop! sunscreen. There is water, emollients (Isododecane, Cetyl Alcohol, Isostearyl Isostearate, Cetyl Behenate) humectants (Glycerin, Caprylyl Glycol, Glucose ), polymers (Acrylates Copolymer, Ammonium Acryloyldimethyltaurate/VP Copolymer), and other functional ingredients such as emulsifiers (Glyceryl Stearate, Behenic Acid), thickeners, (Behenyl Alcohol), and the like. I was also happy to see that Allantoin and Beta-Glucan were also present in what appears to be decent amounts, as these are ingredients that are good for skin - Beta-Glucan has both anti-oxidant and anti-inflammatory properties, and Allantoin has anti-inflammatory properties. Interestingly, some of the top ingredients, Isodecyl Neopentanoate, Diisopropyl Sebacate, and Lauryl Lactate, are actually sold mixed together as a sun protection booster product, called AE Sunboost 1033B by AE Chemie. According to AE Chemie, this is "an optimized mix of esters to boost the SPF sunscreen preparations while achieving an non-greasy, elegant feel". AE Chemie's site also notes that "10% of AE Sunboost 1033B boost SPF by 33%" and "5% of AE Sunboost 1033B boost SPF by 21%". So this might explain the gap between the BASF Sunscreen Simulator's results and the actual SPF listed on the Supergoop! packaging - it seems possible that AE SUnboost 1033B could very well be one of the main components in the product! The rest of the ingredients comprise primarily more emollients (Cetyl Behenate), functional ingredients, such as stabilizers (Glucose Oxidase, Lactoperoxidase), emulsifiers (Lauryl Alcohol), preservatives (1,2 Hexanediol, Disodium EDTA). There is also a whole slew of extracts and plant-based ingredients (Cassia Alata Leaf Extract, Thermus Thermophillus Ferment, Citrus Aurantium Dulcis (Orange) Peel Oil, Eucalyptus Globulus Leaf Oil, Citrus Limon (Lemon) Peel Oil, Geranium Maculatum Oil, Pogostemon Cablin Oil, Aniba Rosaeodora (Rosewood) Wood Oil, Ocimum Basilicum (Basil) Oil, Geraniol). Of course, this is in line with Supergoop! 's own advertisement for its products - that it has natural ingredients. Unfortunately, the natural ingredients turn out to be a mixed bag - while some of these minor ingredients are beneficial for skin (Thermus Thermophillus Ferment, for example, may have some skincare benefits), there are quite a few of them that can be irritating for sensitive skin, although they can provide a nice scent to the product (Citrus Aurantium Dulcis (Orange) Peel Oil, Eucalyptus Globulus Leaf Oil, Citrus Limon (Lemon) Peel Oil, Geranium Maculatum Oil, Geraniol). But I suppose either way, given that these are so far down the ingredients list and likely used in very low concentrations, it's quite likely that you won't get too much benefit or harm from these ingredients. Lastly, let's take a look at the "Cellular Response Technology" part of the product. Supergoop! claims that the sunscreen is "powered by potent antioxidant-rich Cellular Response Technology", which is a pretty vague claim - the "Cellular Response Technology" can pretty much just be any of the anti-oxidants in the product, or a combination of them. But while anti-oxidants are definitely useful as part of a skincare regime, and have photoprotective effects that can be useful before UV exposure. This is why layering an antioxidant under your sunscreen, or formulating a sunscreen with anti-oxidant properties can be useful, as they work synergistically to lessen damage to the skin from UV exposure. But it's not quite the "Cellular Response" that a typical consumer might expect from a cursory reading of the label, in the sense that your skin cells aren't going to magically "respond" better to the sun or the UV rays or anything, and your skin cells aren't going to change inherently as a result of applying the sunscreen. And as a look at the ingredients has shown, there isn't anything in the sunscreen that is going to change the way your skin cells fundamentally work over the long-term (although certainly applying sunscreen has long-term benefits to the skin). I guess the wording is vague enough that "cellular response technology" could just refer to plain ol' anti-oxidant effects from the anti-oxidants in the sunscreen! So that's as much as I can deduce, given the limited information available. So formulation-wise, I guess this is a sunscreen that's a mixed bag. In terms of UV filters, it's got a nice set of UV filters that provide broad spectrum protection, although some of them degrade partly over time. And in terms of the rest of the formulation, in addition to the usual emollients and humectants, it has some very nice anti-oxidants and anti-inflammatories, although on the other hand it also has some potentially irritating ingredients. Now that we've talked enough about the formulation of the sunscreen, I guess it's time to finally talk about the aesthetics of the Supergoop! 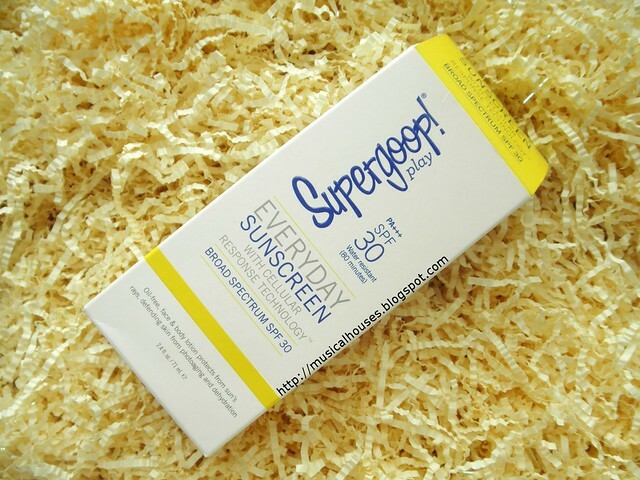 Everyday Sunscreen. This is where the product really lives up to its claims - it is indeed non-greasy and non-sticky, and doesn't leave a white cast. 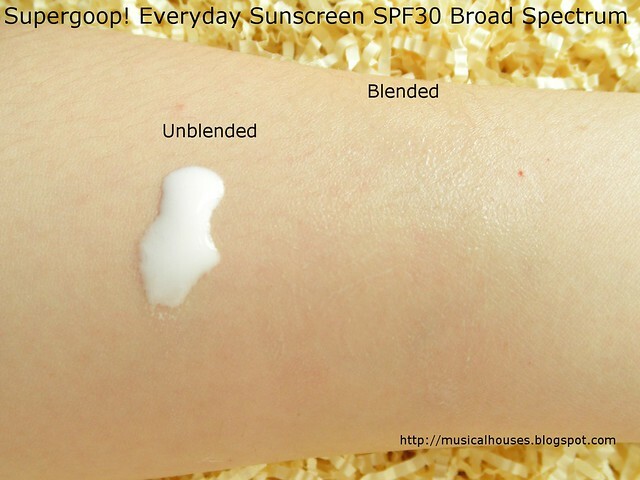 In fact, it has a fairly thin, watery feel for a sunscreen, as compared to the traditional creamy sunscreen textures. 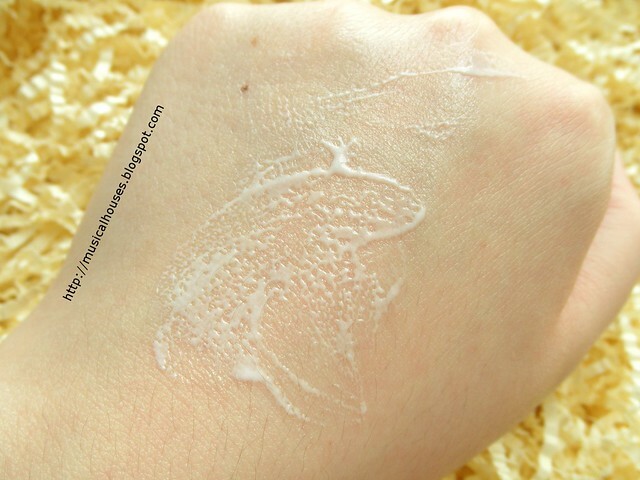 As you can see in the above swatch, although it starts out as a white lotion, it blends out to pretty much nothing on my skin. It also has a slight scent which is, to my nose, vaguely floral with a hint of citrus, which I attribute to the fragrant plant oils in the product. The scent is quite faint, and dissipates fast, but is there on first application. And above, you can see another photo of the sunscreen while it's being blended into my skin, in order to get a sense of how light the texture is. I think that compared to "traditional" sunscreens, this has a really lightweight texture, although it still leaves behind a slightly emollient layer on my skin, similar to that of a moisturizer. It doesn't quite fully "disappear" into my skin at all like some of the Japanese brand sunscreens, but I think it's lightweight enough that the texture doesn't bother me. The only thing that really bothered me was that the sunscreen stung my skin a tiny (and I do mean tiny) bit on first application, so maybe I'm slightly sensitive to something inside. But it didn't burn and the slight stinging didn't persist, so I take it that on the whole my skin is doing well with this sunscreen. On the bright side, it also layered quite well under most makeup, without balling or peeling off. So, would I recommend the Supergoop! 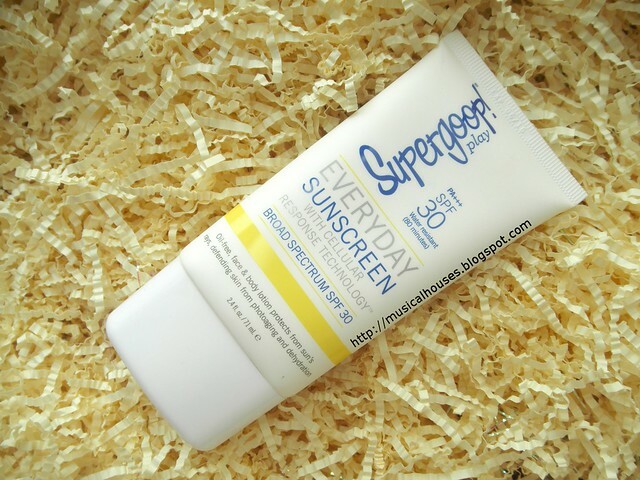 Everyday Sunscreen SPF30? I think it's decent overall, although perhaps not my most favourite sunscreen ever (then again, I have tried a lot of sunscreen!). I think the pros are that it really does feel lightweight and non-greasy, and it really doesn't leave a white cast on the face at all. I also like that it has some ingredients that are beneficial to skin inside it. But the cons are that some of its UV filters degrade over time, and some of the (albeit minor) ingredients may be potentially irritating. I think for me, sunscreen is always a "better something that nothing" kind of product - I would always encourage you to wear a sunscreen, any sunscreen, rather than nothing. So if you love the texture of the Supergoop! sunscreen, and if the alternative is not wearing sunscreen at all, then yes, please wear sunscreen! It's SGD$68 at Luxola, so it's not the cheapest sunscreen you can get, but if this is up your alley, it might be worth checking out. The Bottom Line: The Supergoop! Everyday Sunscreen does live up to its claim of being lightweight and non-greasy, using all chemical UV filters, some of which may degrade over time. 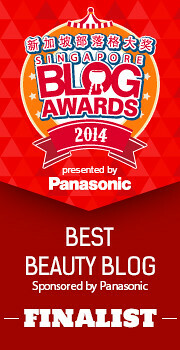 this was such a great overview of sunscreen ingredients! i like the idea of supergoop being non-greasy. sunscreens feel so heavy so that's why i avoid wearing them (though force myself to). i haven't thought much about my physical or chemical blocker preferences though. i'd rather something really protect even if i have to have a white cast. Ooooo, I hadn't known about the Sunscreen Simulator - that's hella useful! I've been curious about Supergoop, because the texture does sound appealing, but I don't get on with the plant extracts in it, so now I know I can stop wondering. Thank you. I shall stick with my La Roche-Posay fluid. Thanks for the very informative review. I have always been looking for the right sunscreen product which could be effective and light weight (for combination and acne prone skin). Any chance if you could comment on Elucent's Day Moisturiser - SPF50 UVA n UVB broad spectrum with 4% AHA and VitB3 & E. Many thanks in advance. @Anonymous: While I'm not too familiar with the sunscreen you mentioned specifically, I generally don't recommend using AHAs in the day, and for that reason your sunscreen (which has 4% AHA) concerns me. AHAs are chemical exfoliants, and while they are excellent skincare ingredients they can make skin photosensitive, which is why it's normally recommend that you use them at night, and use a good shnscreen in the day. Of course, ultimately for a proper assessment we will need to know more information (eg the pH of the sunscreen, the full ingredients list, and so on), but those are my initial thoughts. Hope this helps! 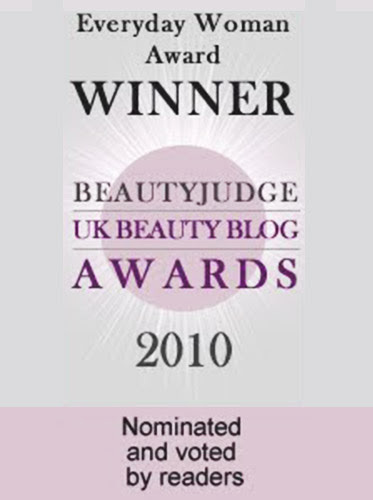 Hi great thanks for sharing your thoughts, it helps clear my doubt too as I have similar reservations but the product with both sunscreen protection and anti-ageing ingredients is just too appealing and hence drawn my attention. 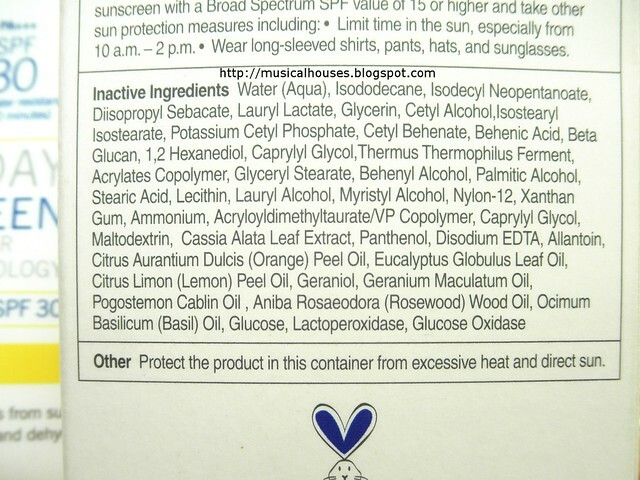 Fyi, only the active ingredients are listed Actives (% w/w): Bemotrizinol 1.5, Butyl Methoxydibenzoylmethane 2.0, Methylene Bis-Benzotriazolyl Tetramethylbutylphenol 1.0, Octyl Methoxycinnamate 4.0, Diethylamino Hydroxybenzoyl Hexyl Benzoate 1.0. The PH level (based on the Q&A on the website) is 4. @Anonymous: I looked on the site and the product has 4% Glycolic Acid. If it indeed has a pH of 4, I wouldn't recommend it, because of the risk of making skin more photosensitive. I would rather use the Glycolic Acid at night instead and use a sunscreen without AHA during the day. Of course your experiences with the product might vary, and it might work well for you, but that's my take on it based on the ingredients listed. Hope this helps!